Rulersmith, Inc. has been designing and manufacturing quality rulers since 1985. Originally incorporated as Omnigrid, founders Randy and Peggy Schafer were inspired to create a better quilting ruler when a ruler Peggy had purchased was difficult to read. Randy experimented with some cans of ink and scrap acrylic and, by superimposing the lines, came up with the design for a ruler that was easy to see and use with both light and dark fabric. Thus the Omnigrid quilting ruler was born. 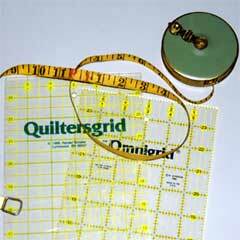 By 1999 Omnigrid rulers had become extremely popular among quilters, and Prym-Dritz purchased the rights to the product line. Rulersmith currently manufactures the Omnigrid rulers for Prym as well as quality acrylic rulers for a variety of uses. Today, Rulersmith continues its focus on creating legible, high-quality rulers in line with the vision the Schafers had all those years ago.